Each tube contains three BORE TEX caps of the same size. Available in original textured matte black or new high gloss blaze orange! FREE SHIPPING ON ALL ORDERS!! *Sales tax for MO residents is 8.241% on the cost of the caps. 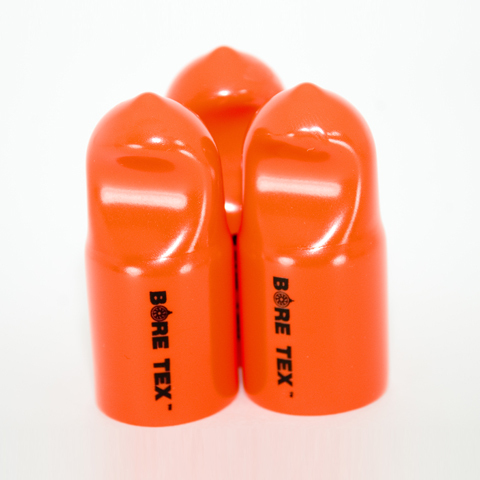 Large BORE TEX fits most most 12 gauge shotguns with ventilated ribs. Medium BORE TEX caps fit most .40 & .50 caliber muzzleloaders, Ar-15/M4 assault rifles, 16 & 20 gauge shotguns with or without a ventilated rib sight, and 12 gauge shotguns with extended choke tubes. Extended choke tubes refers to choke tubes that extend past the end of the factory gun barrel, such as extra full turkey chokes. May also fit rifles with bull barrels. Small BORE TEX caps fit most .17, .20, & .30 caliber rifles as well as 4mm – 8mm rifles. This doesn’t include rifles with bull style barrels. Rifles with a large forward sight may require slitting the cap up to one inch from the open end to fit. Not sure which size? Please contact us at 888-568-9826 to confirm which size will work best. All Pro-Tex Outdoors products are gauranteed to work as described and be free of manufacturer defect. If you are dissastisfied in anyway please contact us at 888-568-9826 for a full refund. ©2009 Pro-Tex Outdoors, LLC, All Rights Reserved Worldwide. For more information please contact us or give us a call at 888.568.9826. Safety First... Always treat firearms as if they are loaded.